Amanda's Quick Bite for Healthy Living: Kitchen Herb Gardens Brighten Your Dishes and Saves You Loads! Kitchen Herb Gardens Brighten Your Dishes and Saves You Loads! Picture this... You're at the store and you spot those small plastic containers of fresh herbs and then have sticker shock from the price for the little amount of herbs! Sometimes, I get it home and I don't use it all because I only used a small amount for a dish. 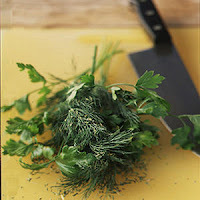 So....to save money and have fresh herbs available, plant your own Kitchen Herb Garden. I live in a small urban condo, but every spring, I plant herbs in small pots on my balcony. When you have your own herb garden, you will use what you need because pruning encourages the plant to grow. Tabouleh Salad - bulgur wheat salad with cucumber, tomato, lemon, garlic, olive oil, and lots of parsley and mint leaves. Pesto sauce for pasta - use fresh basil and parsley in pesto - see my recent post for recipe and pesto menu ideas. Roast chicken - use thyme, parsley, and oregano - see my recipe. Chili - throw in fresh chopped cilantro just before serving and offer extra for people that want more. Scrambled eggs - try a delicate combination of fresh oregano or tarragon with shredded parmesan cheese or fontina. Garlic & cheese bread - spread roasted garlic cloves on french bread and sprinkle with grated parmesan cheese and chopped parsley and place under the broiler for 2 minutes. A sunny spot in your home (try a western exposure window sill or patio). It will take about a week before the seedlings to grow and another 3-4 weeks to start picking your first herbs. Try your local garden store for starter plants for rosemary and other herbs that take longer to grow. Be careful to pick off the start of flowers off the tips. When they go to "seed" they turn the herb to a bitter flavor. For more good ideas and tips on planting your own Kitchen Herb Garden, check out this April 2009 Cooking Light article (photo courtesy Cooking Light).